You will love this virtual note board app, called “Note Board” that will help you remember tasks, write sticky notes, save web content, post pictures, etc… “Note Board” allows you to save content you come across with the Chrome or Firefox browser extensions; AND, is available as an Android or iOS app. Organize notes: move your sticky notes to the board you want and drag the bottom right corner to resize. 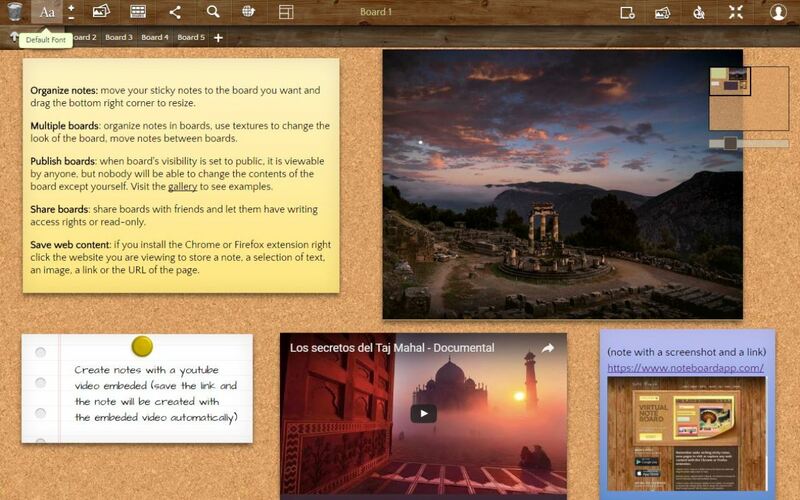 Multiple boards: organize notes in boards, use textures to change the look of the board, move notes between boards. Publish boards: when board’s visibility is set to public, it is viewable by anyone, but nobody will be able to change the contents of the board except yourself. Visit the gallery to see examples. Share boards: share boards with friends and let them have writing access rights or read-only. Save web content: if you install the Chrome or Firefox extension right click the website you are viewing to store a note, a selection of text, an image, a link or the URL of the page. Did you know that the Google Chrome browser is getting a 10th anniversary redesign?